Posted August 27th, 2018 by Mobile Music School & filed under Benefits of Music Education. 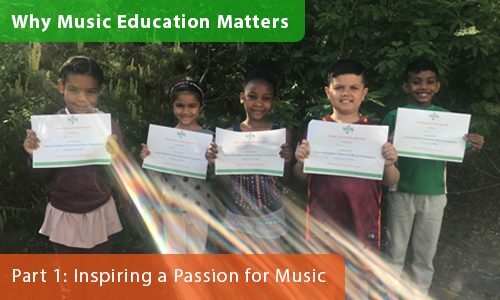 Welcome to part 1 of our ‘Why Music Education Matters’ series, which will guide you through the benefits of music education for the children in your school. Since we began delivering music workshops and programmes to schools across Ireland in 2011, we have found that our child-centred, hands-on approach to teaching has proven to be highly beneficial to all aspects of school learning and personal growth. We believe every child should be exposed to music and given the opportunity to learn and explore their capabilities in a fun, interactive and educational way. Part 3 of our ‘Why Music Education Matters’ series sees Aoife talking about how weekly music lessons from our professional music tutors bring such enthusiasm and energy to the school. Teachers often describe our music lessons as “the highlight of the children’s day”. We must agree, Sophie’s natural love of music and teaching is infectious. She passes her passion for music education on to the children by ensuring each and every activity is engaging and interactive for the students. This child-centred approach captures the interests of the students and inspires a true passion for music in them too. Part 2: Encouraging Classroom Participation coming next week!